The forecast: A mix of sun and cloud. High +5C, low zero. Vegas line: The Stampeders are favoured by five points. Streaks: Winnipeg: 1W; Calgary: 1W. 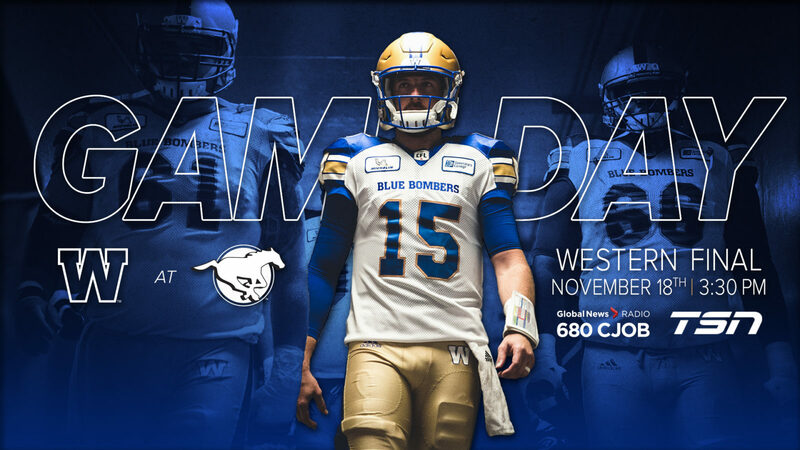 Home/Road: The Bombers are 5-5 on the road this year, including last week’s West Semi-Final win in Regina; the Stampeders are 7-2 at home. Head to head, 2018: The Bombers and Stamps split their season series 1-1. 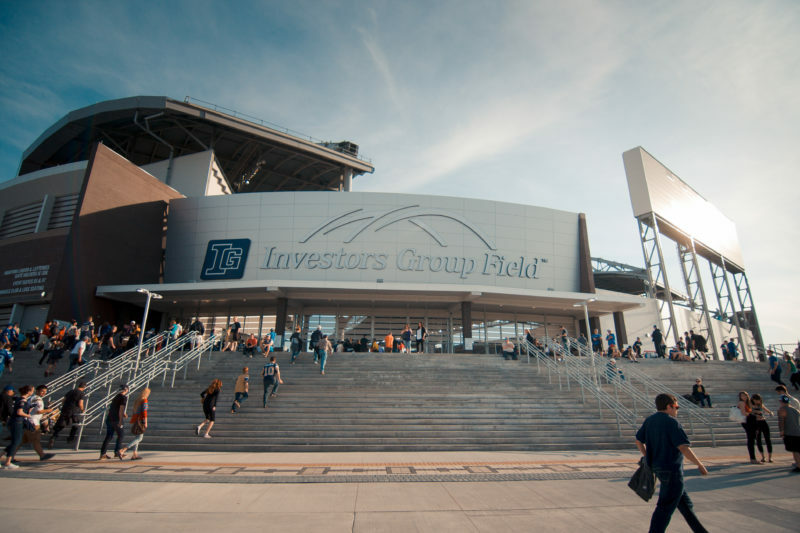 Calgary won 39-26 at home on August 25, with the Bombers countering with a 29-21 victory at Investors Group Field on October 26. The Bombers and Stampeders last met in the postseason in the 2001 Grey Cup, a 27-19 Calgary win. The last non-Grey Cup playoff game between Winnipeg and Calgary was the 1982 West Semi-Final in Winnipeg, a 24-3 Bombers win. Winnipeg and Calgary last met in a West Final in 1965, a best-of-three series won by the Bombers 2-1. Winnipeg then lost to Hamilton in the ’65 Grey Cup, dubbed the Wind Bowl because of blustery conditions. Winnipeg and Calgary have met six times in the West Final, with the Bombers 6-0 after wins in 1945, 1946, 1947, 1961, 1962 and 1965. 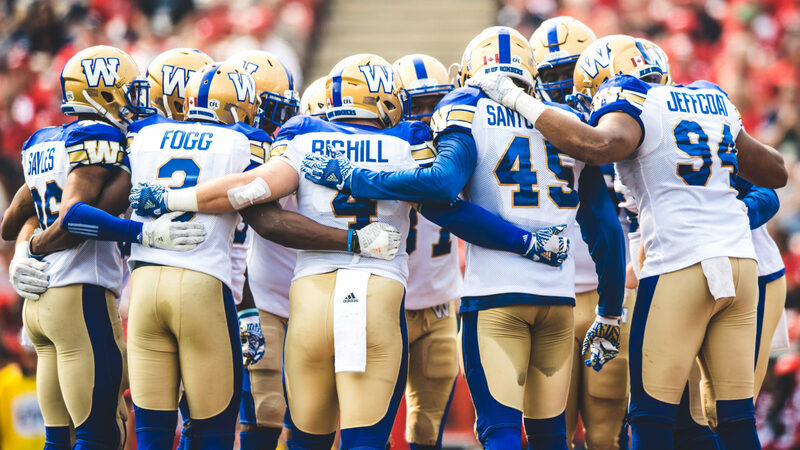 No team in the CFL pounds the ball more than the Bombers after leading the league in rushing this season with an average of 134.9 yards per game and 5.7 yards per carry. 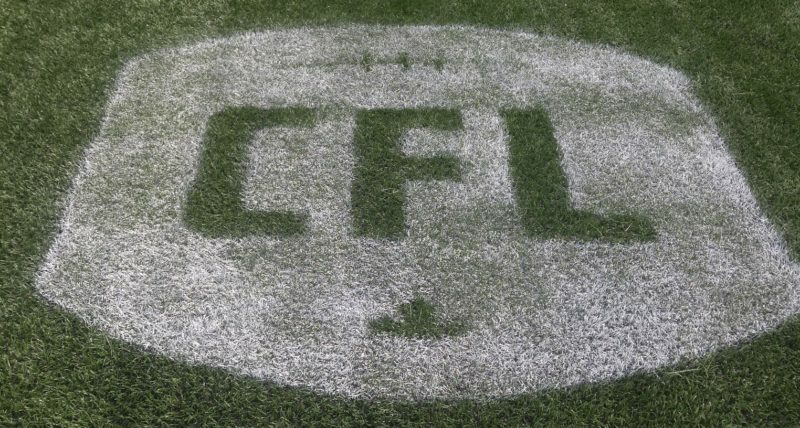 They doubled down on that in the West Semi-Final win over Saskatchewan, cranking out 201 yards along the ground – including 113 in their last three possessions of the game in which they scored a TD and a field goal and chewed up nine minutes and 17 seconds of clock. All this against a Riders defence that ranked second against the run at 91.9 yards allowed per game. And the one team ranked ahead of them? The Stamps, at 86.5 yards. 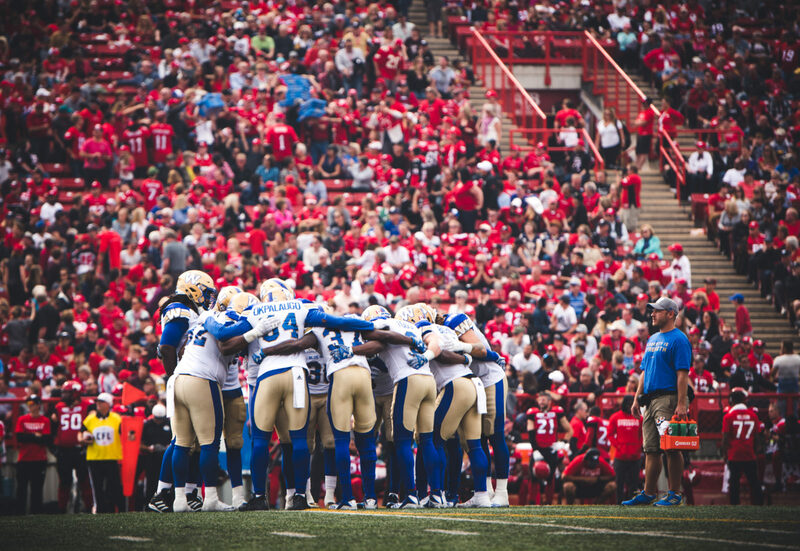 There’s a difference in how each team attacks the line of scrimmage defensively, however, with the Riders moving parts all over the place while the Stamps… well, heck, let’s have Bombers right tackle Jermarcus Hardrick explain it. Simple in theory, not as much in practice. 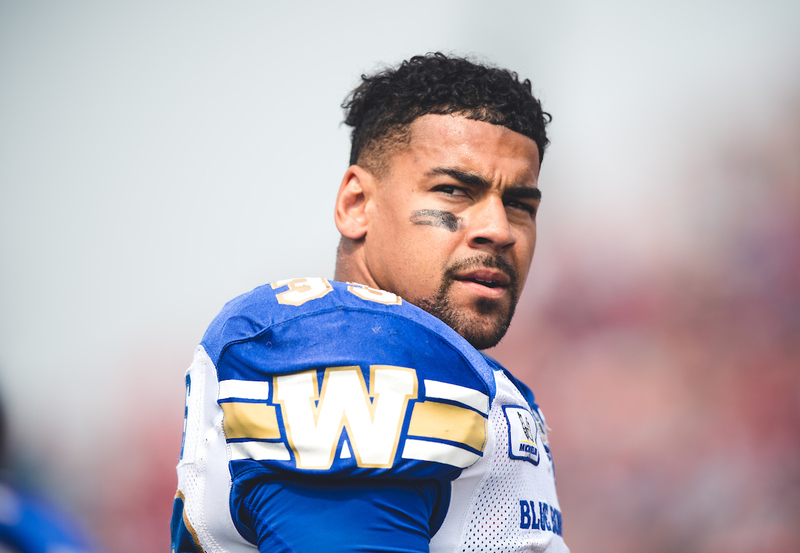 Here’s a nugget worth considering as it relates to pounding Harris along the ground: in his three years as a Bomber, he has carried 58 times for 240 yards in six games against Calgary, for a 4.14-yard average. Yet, in those six games he has 37 receptions for 306 yards, or an 8.27-yard average. Translation: don’t get away from feeding him if the run game is taken away. This just in… Calgary’s QB is good. Damn good. His 69-15-2 all-time regular season record absolutely sparkles. What doesn’t sparkle is his won-lost record in Grey Cup starts – 1-2, after losses in both 2016 and 2017. He’s been driven this year, perhaps even moreso than ever, as evidenced by his 35 TD strikes, with 5,124 passing yards while working with a receiving corps that has been massacred by injuries this year. 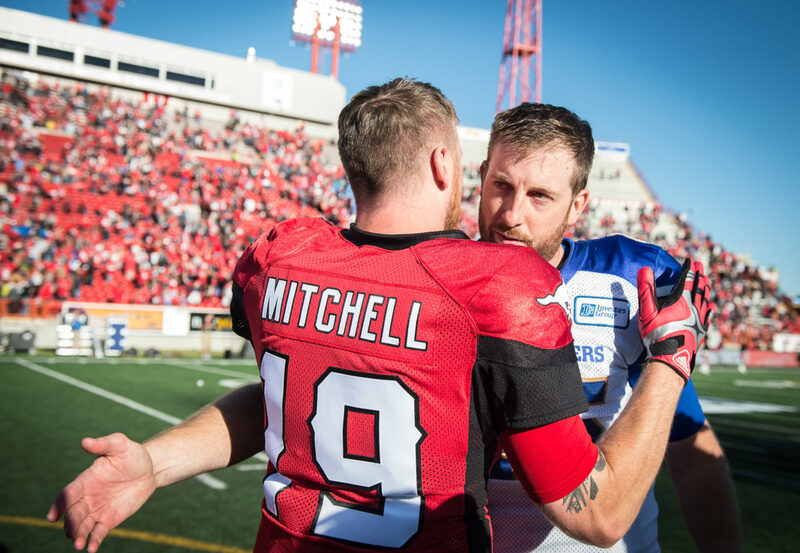 Consider this: Mitchell became the first player in CFL history to throw for 5,000 yards without having a single receiver hit the 1K mark. But his aura of invincibility against the Bombers was also weakened somewhat with Winnipeg’s 29-21 victory in their last meeting. It wasn’t that he was awful by any means – he completed 22 of 35 for 274 yards with no TDs and one pick – but it was a far cry from the personal best 452-yard game he had against the Bombers in August. Glossed over in the Bombers victory last week was their work on special teams, not all of it good. Winnipeg had just a 23.6 net punting average last week (punt yardage minus the return) while the Riders averaged 36.2 yards on kickoff returns. The Stamps also had a better net punting average in the two meetings between the clubs this year and led the CFL in average punt-return yardage at 12.3. All of this is potentially massive when the weather becomes a bigger factor in the battle for field position and every mistake could lead to the season being finito. 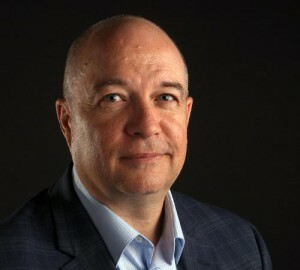 This issue was broached with Bombers head coach Mike O’Shea on Friday, and he still seemed steamed about it, five days after the West Semi-Final. Question: what makes you think that the work this week will lead to improvements for Calgary? Winnipeg’s Matt Nichols is 38-26 in his career as a starter in the regular season. He is 2-2 in his career playoff starts, and 1-8 all-time vs. Calgary. Calgary’s Bo Levi Mitchell is 69-15-2 all-time in regular-season starts, 4-1 in playoff games (not including the Grey Cup) and 10-2 lifetime vs. the Bombers. 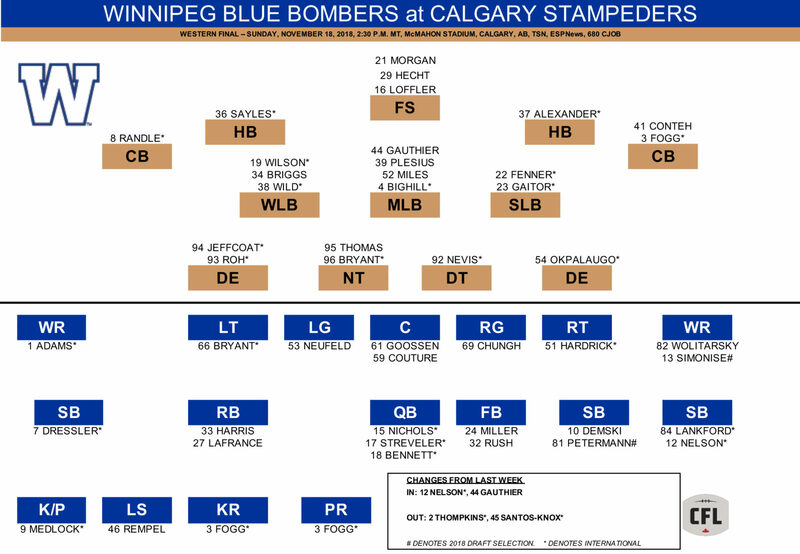 The Bombers are making two changes to their 46-man roster from last week’s game in Regina, bringing aboard SB/KR Charles Nelson and LB Shayne Gauthier, while moving SB Kenbrell Thompkins and LB Jovan Santos-Knox to the one-game injured list. 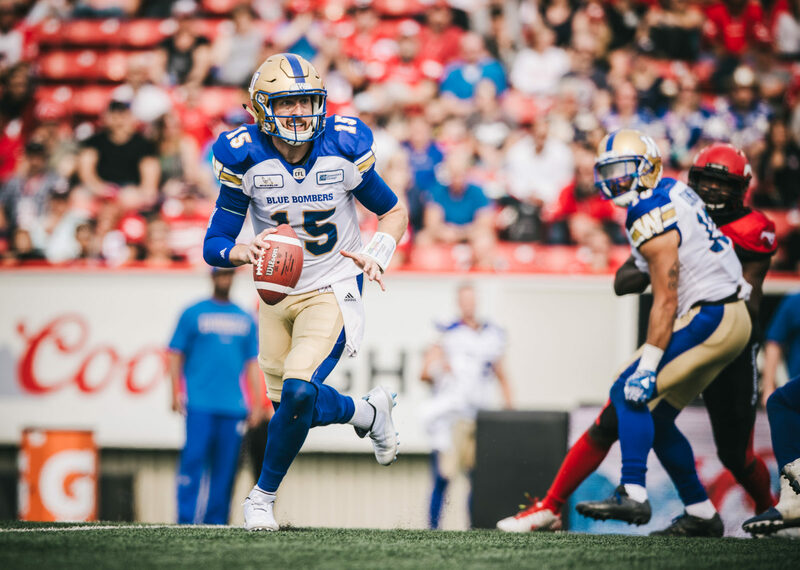 #15 Matt Nichols, QB: He’s returned to his old self since the Banjo Bowl and has now thrown 133 passes in the playoffs without an interception, the third-highest total in CFL postseason history. Since September 21 his TD:interception ratio is 8:1. #23 Anthony Gaitor, LB: Gaitor has settled in comfortably to the SAM linebacker/Dime spot and has evolved into a real playmaker at the position. #19 Kyrie Wilson, LB: He was busy splitting the Santos-Knox spot last week with Ian Wild and quickly shook off whatever rust might have accumulated since his last game in July. #3 Kevin Fogg, DB: He made a critical interception in the West Semi-Final that was a massive turning point in the first half. He’s also a capable punt returner who could be a difference-maker on special teams. 21-0: The Bombers and Stamps are a combined 21-0 when winning the turnover battle this year. Winnipeg is 10-0; the Stamps are 11-0. 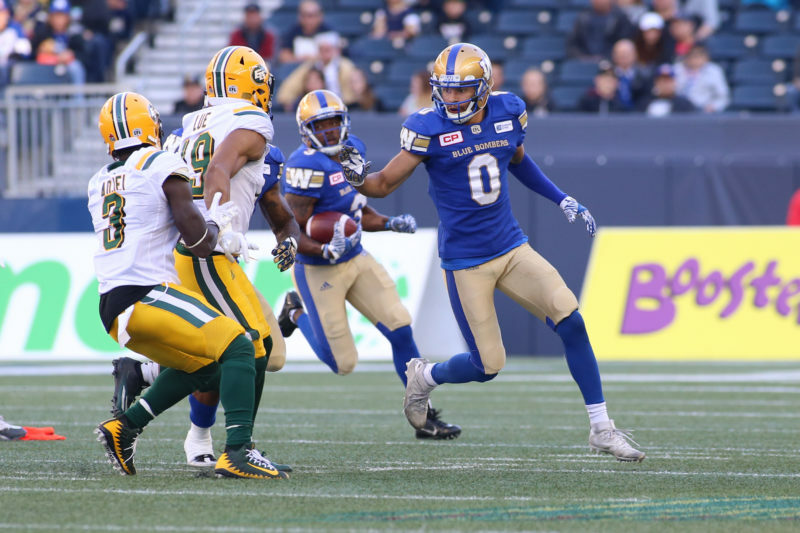 The two clubs are both winless when turning the ball over more than their opponents – Calgary is 0-5, the Bombers are 0-6. The Stamps are appearing in their seventh straight West Final, a feat accomplished by only five other clubs. The Saskatchewan Roughriders were in 11 straight division finals between 1966-76, while the Ottawa Rough Riders were in eight consecutive East Finals from 1972-79. Ditto for the Bombers of 1987-94. The last time Winnipeg knocked off the Stamps in Calgary was the third game of the 1965 West Final in which Bombers hall of famer Ken Nielsen pulled in five passes for 189 yards and two TDs – including a 109-yard TD strike from Ken Ploen that is a CFL record. Justin Medlock is 22-of-26 in career playoff field goals, good for an 84.6 percentage and ranking him seventh all time. Calgary’s Rene Parades ranks fourth all-time with an 89.5 percentage (17-of-19).